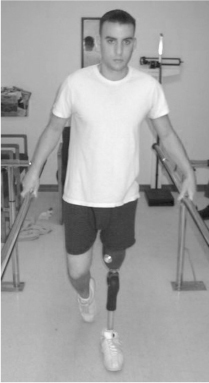 Receiving your definitive prosthesis is a similar process to when you were given your temporary prosthesis. Your prosthetist will take several measurements and an impression of your residual limb in preparation for a check socket. The process for fabricating the check socket normally takes about a week. Once your check socket is ready you will see the prosthetist again so that adjustments can be made to the fit and alignment of the check socket in preparation for the definitive socket. In about a week’s time your prosthetist will have a definitive socket fabricated. The visit to fit the definitive socket typically takes about one hour. The prosthesis is dynamically aligned for optimal performance. The definitive socket may be fabricated of a laminated carbon or other composite materials. Definitive sockets may also be made of thermoplastics as well. Once all adjustments have been made, you will be able to take the definitive prosthesis home with you. You will be given a follow up appointment in about one week. At this time, if the prosthesis is functioning well and no changes have to be made, a cosmetic covering may be considered if you wish. Cosmetic covering may be made of a soft foam or a rigid foam. It gives the prosthesis a natural appearance, typically matching the previous shape. The outer coloring/tone is typically incorporated into a nylon or a rubberized prosthetic skin that is applied over the cosmetic cover. The prosthesis can typically be finished to match your sound side. You will be given follow up appointments which will allow your prosthetist to assess your progress and make adjustments as needed.